The Five Rituals - Eye of Revelation - Peter Kelder! 30 Years Younger – In Just 10 MINUTES a DAY! Hidden deep inside the Himalayas is a secret almost too good to be true. It’s a secret that can enable you to look a shocking 30 years younger – in just 10 weeks from now, working just 10 minutes a day. It’s a secret that can remove your wrinkles. It can restore your natural hair color. It can improve your memory. It can correct your eyesight. It can turbo-charge your energy levels, your strength, your virility. This secret can turn you into a 25 year old again, WITHOUT QUESTION. But it’s not made lightly. It’s backed by a close group of many thousands of followers – including actor Martin Sheen, and author John Gray (“Men are from Mars”) – both of whom claim it as the reason for their youthful looks. So, would YOU like to discover more about these SECRET Five Rituals? "The quickest and easiest way to both LOOK and FEEL younger! The Five Rituals are not only fun, but incredibly powerful. I’ve seen amazing results after just three weeks, and intend to use this system for years to come. Brilliant!" - And What His Findings Mean to YOU, TODAY! It was the year 1930 in Southern California. A young gentleman named Peter Kelder was taking a leisurely stroll, when a sudden shower broke out. He ran for cover to a nearby Travelers Club. There, randomly, he sat at the table of a retired British army officer, known as Colonel Bradford. The Colonel was a wrinkled, stooping man in his late sixties, drained of physical energy, unable to walk without the help of a strong cane. Yet despite their differences, the pair soon became friends – and regularly met to discuss the Colonel’s many varied travels. Of all of his topics, Colonel Bradford preferred to talk about India. Colonel Bradford decided to leave – and find that monastery for himself. The Colonel occasionally wrote to Kelder with updates of his progress. He eventually reported that he had found the monastery. But then the scent ran dry, and Kelder heard nothing more. His hair was a rich brown once again. His complexion was smooth and fresh. He no longer walked with a stoop. He was energetic, and strong, and virile, and HAPPY. Asked how old he looked, most people guessed 38. 30 Years Younger in Just 10 Minutes a Day! As Used by Martin Sheen, John Gray & MORE! The Five Rituals are simple. They’re a series of five simple movements that can be practiced in just 10 minutes a day. They involve simple, yet precise movements that virtually anyone can perform – whether you’re 30, 50, or 100. And it was these exact same Five Rituals that Colonel Bradford discovered in that Lamasery, in deep India. The same rituals he went on to teach to “The Himalayas Club,” a large group of individuals over 50 years old – all of whom went on to both look and feel half their age again. The exact same Five Rituals that were passed onto Peter Kelder, who went on to write “The Ancient Fountain of Youth” and “The Eye of Revelation” – where he documented the amazing power of these five rituals, and how they had the power to radically make anyone look and feel better. Kelder’s work received critical acclaim when it was published, way back in 1939. But until recently, it was thought that every copy was LOST. Until a recent copy emerged yet again – and individuals began practicing and seeing the immense benefits of the Five Rituals within such a short period of time. So, how long do the Five Rituals take to see results? Just the same as they did with Colonel Bradford. It takes just TEN MINUTES a DAY – and you’ll begin seeing results within just one week. It’s best to compare after ten weeks however, where you’ll see the most dramatic change. You’ll literally feel 25 again. And if you’re already 25, you’ll enjoy all the other benefits too – such as improved memory, enhanced eyesight, greater energy! And it’s cumulative too, like compound interest. As soon as you’ve done these enjoyable exercises for ten weeks, the effects get quicker and quicker and quicker, and more and more noticeable. It’s the Eastern secret that Western cosmetic surgeons don’t want you to know about. Right now, many hundreds of thousands of close followers across the globe are currently practising the Five Rituals every single day – and enjoying the phenomenal benefits. The Five Rituals secret is out. And it’s your turn to take advantage. "As an author, an interviewer, and a director, I need all the energy I can muster. The Five Rituals program is fantastic! I’ve been following it for weeks now, and feel fantastic. Not only am I looking better, but I’m healthier and enjoying an all-natural life high. I highly recommend the Five Rituals package!" "The Ancient Fountain of Youth!" So, would YOU like to discover the secret of the Five Rituals? At the official Five Rituals.com website, we’ve slowly tracked down and pieced together all four parts of “The Ancient Fountain of Youth” 1939 book by Peter Kelder. We’ve digitally remastered the book, making it easier to read – and kept the original drawings. We’ve even created modern animated versions, to make it easier to understand. But the course remains ORIGINAL and TRUE to the REAL TEACHINGS of Colonel Bradford – and the secret Five Rituals he discovered within the Indian Lamasery. The EXACT Five Rituals that Colonel Bradford discovered in India – and how YOU can perform them in the comfort of your own home! Why you ONLY need to follow this secret practice for TEN MINUTES each day. Do it longer at your own peril! The SECRETS contained in ALL FOUR PARTS of the long-lost Kelder manuscript. Cheap imitations only ever have access to part one! The REASON the Himalayas Club was founded – and the STAGGERING RESULTS they enjoyed after just 10 weeks! The little-known DIET CHANGES that Colonel Bradford recommends to make you LOOK and FEEL YOUNGER in record time! How a TINY VOICE TRICK can keep you masculine and virile! – Whisky drinkers do this all the time, accidentally, and don’t realize the benefits! The PRECISE STEPS you must take if you’re overweight, or underweight. Getting these right is EASY. Get them wrong, and you’re wasting your time. How to FEEL and ACT like a 25-year old – for the rest of your life! Why you need to SPEED UP the “vortexes” in your body. It sounds weird, but there’s a real science behind the myth! The Five Rituals course is a true phenomenon. It’ll make you LOOK and FEEL younger, in just days. And that’s guaranteed. Would YOU like to download a copy of the Five Rituals course? Such As Better Eyesight, Strength, Virility & More! That’s the question your friends will be asking – in just ten weeks from now. And don’t forget how you’ll FEEL too. That's not all. You’ll not only look and feel great, but you’ll also begin to experience some fantastic health benefits, too. Your eyesight will improve dramatically. Your strength and virility will radically increase. Your memory will get noticeably better. You’ll feel happier, more alive, more EXCITED about life! Can you IMAGINE how that would FEEL – RIGHT NOW? And it doesn’t matter how old you are. You could be 20, 30, 50, or 100. It’s irrelevant. However old you are, you WILL be able to do these exercises – and you WILL experience profound benefits. Are you ready to discover the SECRETS of the FIVE RITUALS? Order TODAY, and we’ll send you the FULL ORIGINAL BOOK by Peter Kelder, with all four parts digitally remastered – and containing ALL of the teachings from way back in 1939. You’ll receive the full 50+ page book, with images showing you EXACTLY how to perform the Five Rituals. We’ll also send to your our own unique introduction to the Five Rituals program, including an audio version commissioned directly for this website. You’ll ALSO receive a link to our own animated versions of the Five Rituals, so you can see PRECISELY how everything works – without leaving your computer screen. It can’t get any easier than this. And YOU could be enjoying ALL of these secrets – just MINUTES from now – for the low price of JUST $69.95 -- $39.95. That’s the BEST PRICE we’ve ever offered the entire package. Distributed as PDF and MP3 audio files. Suitable for Windows or Mac computers. "I have done the Five Rites and passed 'Ancient Secrets of the Fountain of Youth' on to many friends over the years. I recommend them without reservation." AND the Chinese Secrets of Youth & Vitality! Are you ready to discover EVEN MORE ancient world secrets? Grab YOUR copy of the Five Rituals before MIDNIGHT, TODAY – and you’ll automatically receive three further personalized guides – containing FURTHER SECRETS of the ANCIENT WORLD. Native American Indian Healing Secrets – Tap into the secret wisdom of the Native Americans, and learn how you can heal yourself using nature’s own pharmacy. From getting rid of the common cold, to enjoying a sudden surge of energy, you’ll be given the exact recipes you need to heal in the best possible way for you. Ancient Beauty Secrets of Ayurveda – For over 6000 years, the secrets of timeless and radiant beauty have been safeguarded in India by practitioners of Ayurveda, the world’s oldest system of health care and healing. This guide shows you how to diagnose and treat yourself, and provides common Ayurvedic treatments. Ancient Chinese Secrets of Youth & Vitality – Discover the secrets of longevity, by tapping into the “balance”-based principles of the Chinese Masters. Learn the wisdom of the Tao, uncover the foods of the “immortals,” the superfoods you DO NOT want to miss, the meditation program you probably haven’t heard about, and much more! These three bonus books are the PERFECT accompaniment to the Five Rituals book. And they’re ALL yours – FREE of CHARGE - when you order TODAY! "The Five Rituals book reads like a Robinson Crusoe adventure! I loved it. But it's more important than mere entertainment: this is the key to life-long health, vitality and youthful looks. I use it daily and am VERY impressed." Here's Our 100% RISK-FREE Guarantee! After Just 10 WEEKS - We'll Refund Every Cent! Want to try out the entire Five Rituals program – RISK-FREE? Here’s perhaps the WILDEST guarantee you’ve ever read. We promise that you’ll look BETTER than you did at 25 -- after just 10 WEEKS of following the Five Rituals course! Just follow the program for 10 short weeks, following the fun routines for just 10 minutes a day. You WILL look BETTER than you did at age 25, or we’ll refund EVERY SINGLE PENNY YOU PAID. There’s NO small print. NO questions asked. NO before and after photos required. Just let us know after the trial period and we’ll return EVERYTHING. You can even keep the three ancient wisdom guides with our thanks for giving it a go. And it’s fully backed by our publishers, the The SelfDevelopment.net Network, too. So you know you’ll NEVER have a problem getting your cash back. But you won’t want it back. And you’re about to be amazed. "Excellent. I use the Five Rituals daily to help keep my youthful complexion. I would've never discovered these techniques if it wasn't for your website. Thanks for sharing with the world!" Decide to Order the Entire FIVE RITUALS Kit! Isn’t it about time that YOU discovered the secret of those Tibetan monks? Then take action NOW – and begin enjoying the results within just a week. 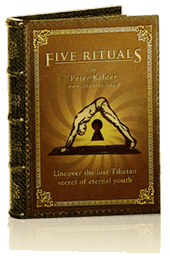 The FULL, ORIGINAL Five Rituals Book – Discover the SECRETS of ETERNAL YOUTH, straight from the original guide by Peter Kelder. Follow Colonel Bradford’s adventures into India – and learn EXACTLY what he discovered. Digitally remastered, with crisp images, ready for printing. Plus, includes the secret SIXTH ritual from Kelder's long-lost second book! The Five Rituals WELCOME PACK – Including our own welcome to the Five Rituals, our specially-created audio introduction, our animated Five Rituals, and our FULL 24/7 online support package. BONUS: Native American Indian Healing Secrets – Tap into the secret wisdom of the Native Americans, and learn how you can heal yourself using nature’s own pharmacy. From getting rid of the common cold, to enjoying a sudden surge of energy, you’ll be given the exact recipes you need to heal in the best possible way for you. BONUS: Ancient Beauty Secrets of Ayurveda – For over 6000 years, the secrets of timeless and radiant beauty have been safeguarded in India by practitioners of Ayurveda, the world’s oldest system of health care and healing. This guide shows you how to diagnose and treat yourself, and provides common Ayurvedic treatments. BONUS: Ancient Chinese Secrets of Youth & Vitality – Discover the secrets of longevity, by tapping into the “balance”-based principles of the Chinese Masters. Learn the wisdom of the Tao, uncover the foods of the “immortals,” the superfoods you DO NOT want to miss, the meditation program you probably haven’t heard about, and much more! FULL 10-WEEK GUARANTEE – Try it the entire course out for a WHOLE 10 weeks, absolutely RISK-FREE! If you’re not thrilled, or aren’t seeing the results you expect, just let us know and we’ll refund you in FULL. You can even keep the three bonus guides with our thanks! That’s less than the cost of a decent meal for two. And for that price, you’re discovering what Colonel Bradford spent FOUR YEARS travelling throughout India to find. You’re tapping DIRECTLY into everything he learned – and discovering for yourself the SECRETS that will knock YEARS off your looks, in JUST TEN MINUTES A DAY. Are YOU ready to begin LOOKING and FEELING YOUNGER? Can you imagine taking your features – your hair, your face, your strength, your health – right back to the state they were in when you were, say, 25 years old? And what’s stopping you right now? There’s NEVER been a better chance to discover the Five Rituals. This is the cheapest we’ve EVER offered this entire package. So if you’re even REMOTELY interested in taking action, you MUST grab your copy NOW. PS. What did Colonel Bradford discover in that hidden Shangri-La, deep in the shadows of the world’s tallest mountains? There’s only one way for you to find out. Click HERE to grab your copy of the Five Rituals kit. PPS. Remember, this package is NOT available anywhere else! Cheap imitations are available, however. And they’ll only give you part one of the book. They totally ignore parts two, three and four – which even include the magical SIXTH ritual. Click HERE to purchase the full, official Five Rituals kit! PPPS. There has NEVER been a better time to grab your copy! After we’ve sold 1000 copies of this guide, we intend to replace this page with a support site – in order to protect the purchases of our customers so far. The last 500 copies will also have the sales price increased to $99.95, as a reward to early bird buyers. This is the BEST TIME TO BUY.